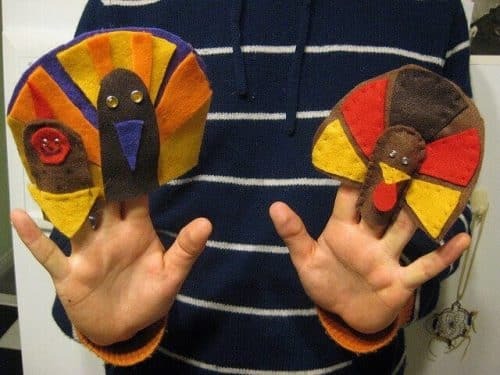 Thanksgiving craft idea – A really fun way to get kids thinking about Thanksgiving and what they’re thankful for is by having them make their own Thanksgiving puppets. The great thing about this project is that the kids will have fun making their puppets and then enjoy playing with them after as well. You can use this opportunity to teach them about Thanksgiving or simply just ask them what they’re thankful for! Trace a large arch shape onto a large piece of felt. Cut it out and then trace and cut another one out of the exact same size. Next you want to cut out different colors from your felt selection to make the feathers. Make sure they will fit within the arches you cut out. I recommend tracing one, cutting it out and checking to make sure it will fit. Then trace that piece onto the other colors you want to use. Next you are going to cut out the felt where the face will go. Trace widely around your finger on the color of felt you want to use. Cut it out. Cut out a little triangle for the nose. And cut out a little imperfect oval for the wattle. Take your needle and thread, tie a large not on the of the thread and stich together the arches. Do not stich the flat side of the arches together, because this is where your fingers will go to play with the puppets. Then take your felt glue and glue on your felt feathers and turkey head (where you traced your finger). Decorate your turkey with googley eyes, pom-poms and precut felt flowers to make these turkeys extra pretty. Put on a Thanksgiving puppet show for family and friends!